For its time Pink Floyd’s The Wall represented the band’s most ambitious concept: a double album that spoke of the divide between rock stars and their fans, not to mention alienation and isolation. The subsequent tour that followed was groundbreaking in which an actual wall was constructed throughout the show that obscured the audience’s view while the band was performing. And of course there was the memorable grotesque-looking animation and artwork provided by Gerald Scarfe. Scarfe’s recollection of that period in Pink Floyd’s history is the basis for this wonderful, visually striking retelling of the making of The Wall, and it is perfectly timed with former Pink Floyd bassist Roger Waters’ current Wall tour. 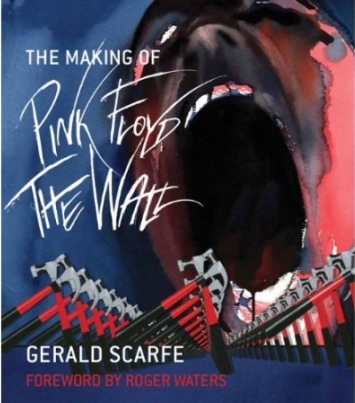 The book documents how Scarfe met Pink Floyd in the early ‘70s and became immersed in the development of The Wall as far as the visuals were concerned. (There are some sketches and drawings that showed how the fantastic-looking characters such as Pink, his wife, mother and the teacher evolved). Scarfe also provides insight to the staging of the tour (which was only performed in four cities 30 years ago) as well the making of the 1982 movie version of The Wall and the tension among the principals involved, including himself, Waters and director Alan Parker. He also interviews the surviving members of Pink Floyd and Parker to get their take about the work. For fans of the album and the tour past and present, Scarfe’s book is a must-read.